On October 5, 2006, Kohl’s Department Stores embarked on the largest grand opening in its history, opening 65 stores in 30 states. At an analysts’ convention in Tampa, they also revealed future plans for expansion. Currently, Kohls has about 820 stores in 45 states; however, they plan to open 115 stores next year, and about 270 more between 2007 and 2010. Their same-store sales were up 16.3 percent from the same time in 2005, and September 2006 total sales rose 26.1 percent. The linear growth model of Kohl’s reads more like a log function than anything else. Coming from suburban Milwaukee, Wisconsin, Kohl’s has grown by leaps and bounds to be as successful as it is today. But why? I offer up a few suggestions. The first is that Kohl’s was opportunistic and came up at the right place in the right time. Kohl’s Department Stores began in 1962 under the helm of Max Kohl, a grocer in the Milwaukee area since 1946 who operated Kohl’s food stores. In 1972, the British-American Tobacco Company (BATUS) purchased both Kohl’s grocery and department stores, yet the Kohl family stayed on to administrate the stores until 1979 when they left altogether. Interestingly, Max Kohl’s son Herb is now the senior United States Senator from Wisconsin. Through the 1970s and early 1980s, Kohl’s grocery and food stores operated in tandem and were often physically adjacent in shopping centers throughout southeastern Wisconsin. At many locations, the stores also shared an entrance and customers could choose whether they wanted groceries or a department store by turning left or right once inside. The stores were, however, physically separated by a barrier and only the front entrance atrium was common to both. In 1983, the grocery store division of Kohl’s was sold to A&P, who continued to operate and even open new locations until they all closed in 2003. BATUS continued to operate Kohl’s department stores until 1986, when they were sold to a group of independent investors who continues to operate the stores today. Expansion came slow for Kohl’s at first, but once it began it rose exponentially. Until the mid 1980s there were less than 40 stores in Wisconsin, Illinois, and Indiana. 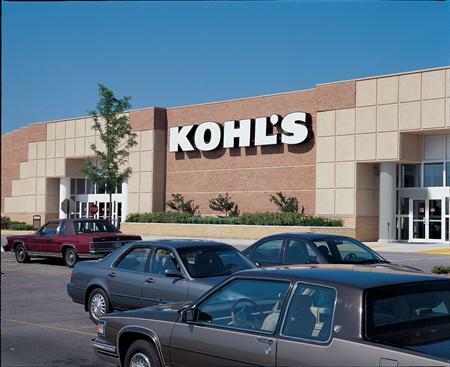 Also in the mid-1980s, Kohl’s took over a struggling similar chain called Main Street Stores in the Chicagoland area, and they opened their store in my hometown of Janesville, Wisconsin in 1986, in a former Montgomery Ward location in the Janesville Mall. Since the 80s, Kohl’s has expanded where other chains have failed, pairing its excellent customer service reputation with high quality, often name brand merchandise at discounted prices. 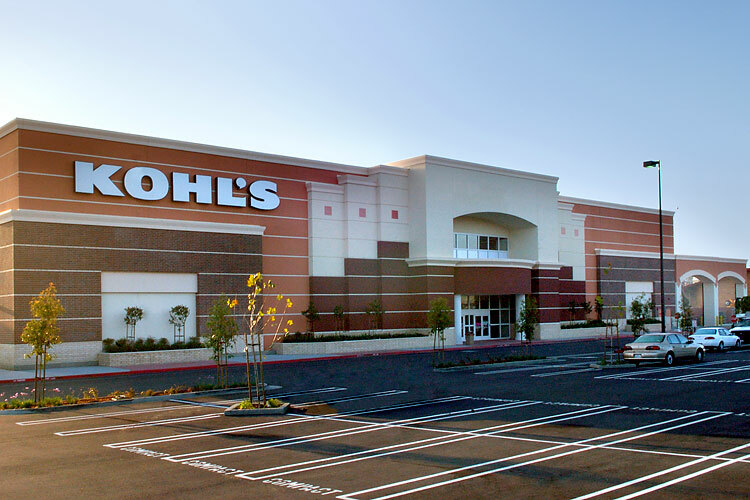 Kohl’s made a niche market for itself in between discounters such as Target, Wal-Mart, and K-Mart, and full-line department stores like Macy’s, Dillard’s, and JCPenney. 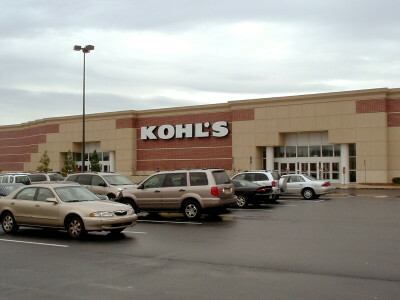 As Kohl’s focuses heavily on softline merchandise and very little on electronics (aside from small appliances and gadgets, Kohl’s abandoned its full electronics department in 1994) it is very popular with women. They’ve used other chain failures such as Clover, Ames, Caldor, and Bradlees in the northeast to swoop in and open stores there to expand their concept over the past 9 years. 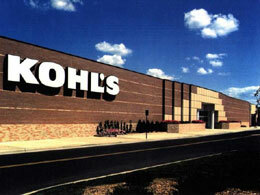 If Kohl’s continues on their track to 1,200 stores by 2010 they will be one of the most successful chains in history. Kohl’s is THAT popular? I admit, they have some brands I like and I only need to shop the bargain racks for things at great prices. But I don’t go there THAT often. Maybe it’s taking the place of Mervyn’s? 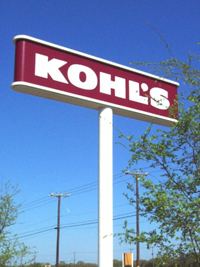 The current signage Kohl’s uses now was introduced in the mid-1980s. Before this, they used a logo in script lettering (either red or white), with some stores bearing the ‘department stores’ subtitle, and others did not. I recall those old signs fairly well on mall locations here in Wisconsin. They all came down and were replaced as those old stores were remodeled starting in the mid 1990s. Southridge Mall (Greendale/Milwaukee), East Town Mall (Green Bay East), Northland Mall (Appleton North) and Valley Fair (Appleton South) — I should note this was one of the only combo department / grocery stores north of Milwaukee, Memorial Mall (Sheboygan — Kohl’s replaced a G.C. Murphy store in 1981-1982), South Towne (Madison South, and Washington Mall (aka Paradise Mall, West Bend…my first trip to a Kohl’s dept. store when I was 4 yr old)….these malls had the old signs and/or store design. If you went into Milwaukee, you found a few more department / supermarket combos as you stated in your post. The last time I saw the old logo/signs was in 2000, at Valley Fair Mall, and that store was closed a month after visiting, replaced by a new store 5 miles down the road in a new big-box center. With Shopko no longer locally run, and Pranges / Prange Way, as well as mall chains like ‘id’ all up in the ‘big mall in the sky’, that leaves Kohl’s virtually the only WI-based retailer left, and it’s easy to see why they have suceeded and continue to thrive, and probably will for a long time. While now they set up sets of 4 checkout lanes by each entry, the old store models had all the checkouts lined up front like at your typical discounters. Never shopped at the food stores. They were expensive under A&P’s ownership. Remodeling was done too late into the chain’s life. The stores here were iconic for their arched roofline. I think you guys have an overly-rosy picture of Kohl’s likely due to the fact they’re your ‘Sconsin homeboys. The way I see it, Kohl’s is overexpanding like almost no chain before them, and they have a rather bland and un-loveable format. They inspire none of the loyalty that’s kept most traditional department store chains afloat, and offer none of the verve of their strongest discount store competitors, such as Target. Kohl’s is a relatively decent place to buy clothing, but their brazen over-expansion combined with the company’s rather faceless and unloveable image is probably going to set the stage for a very rocky period at some point in the not-so-distant future. I just don’t see anything about their model as being truly revelatory. I agree with Caldor. Even the enhanced Kohl’s look like one-off JCPenney stores, and Penneys does a better job with the concept. I wish them all the luck in the world, but they’re putting up way too many stores with way to little that’s special about them. I think to understand the lure of Kohl’s, you have to think of it from the perspective of the typical Kohl’s shopper, and not from the position of a gen X/Y male. She’s a busy active grandma on a budget but still likes to be fashionable and smell nice. Or maybe she’s a young mother of many who likes to feel like she’s getting a discount on baby clothes and some really cool knick-knacks. Tongue in cheek here, but you get the point. Their demographic doesn’t really include men at all. While they have a full men’s clothing department, and people shop there, this is not the reason nor is it the target demo Kohl’s wants to reach. Looking at it from this perspective, there really isn’t much to offer, no. So I can understand, and pretty much share the same viewpoint. But realize that to their target audience, Kohl’s is great. I know many women, middle-aged and even women my own age, who love to shop at Kohl’s. For them, Kohl’s is an image of fashion and value, and is a step above many of the discounters, and essentially a softlines step to the side of hip, trendy Target. Further, I don’t think they could have gotten as far as they did without establishing this niche or image to their target demo. You may not shop there and hell, I don’t shop there much; but clearly, many people do. Their sales books ain’t lying. It will be interesting, though, when (if) people finally do get tired of them. They’re well on their way to being this monster behemoth, for better or worse, and eventually the bottom might start to fall out. Though, I predict for the short-run, possibly the next 5-10 years, they’ll be doing well. Good dialogue, this is what I like! Caldor couldn’t have summed it up any better. Kohl’s came out of nowhere for me, seeing my first Kohl’s in 2001 I’ve held the same reaction to them ever since. Their prices are alright, their selection is at best large but mostly mediocre, bland clothing and their image in uninspiring and cheap. Their store designs are strictly uninform as well. Their image spins-off of other boring, fashionably flat and struggling stores like JCPenney and Sears, both of which have lost distinction within not being able to set themselves apart like (say) Target has. Unlike Sears and JCP, Kohl’s doesn’t really have any reputable departments like Sears’ tool center and JCPenney’s catalog store. I resented Kohl’s for years because they moved into all the old Bradlees near me (I LOVED Bradlees). I know it’s stupid, it’s not their fault but I couldn’t bring myself to go there but last year I finally did. It’s just ok, like everyone else has mentioned, there is notthing special about it. I feel like they are just expanding because there are vacant spaces available (although i know alot more thought goes into it than that) I don’t know anyone who gets excited about Kohl’s or anything they bought there but it’s probably not worse than any other blah store that’s out there. There’s no doubt that Kohl’s has a strong following. And it’s true that I’m not one of these people demographically, so I won’t judge them further on the basis of taste. But I read somewhere that Kohl’s stores typically are profitable for four to five years, then the sales go flat afterward. They’ve sustained themselves over the last decade or so by constantly opening new stores, which begs the question: if they saturate their markets, where will they go from there? JCPenney has its depth of sizes to fall back on, Sears has a broad merchandise mix. Target has the high-traffic everyday items. And Kohl’s has…? Oh cool. Yes, that’s the one. That one was actually being used up until a few years ago at the Watertown store before they moved it to Johnson Creek to be more accessible to the Outlet Mall shoppers and to I-94. It was also recently visible at the mall in Sheboygan, but not anymore. Kohl’s is my favorite department stores. Since I travel across America, it is very convenient and economical for me to shop for anything in clothing, home decorating, gifts, candles, bedding, nearly anything I need or want. I have never been dissappointed in any of my purchases. Nor in any of the employees with whom I have had dealings. Until recently. I would like to talk with someone in Customer Relations at headquarters but have not been successful in being to reach anyone to tlak with. How does a person contact Customer Relations for Kohl’s? For women, Kohl’s is a great place to find clothes our tastes and sensibilities. Target’s clothing has gone downhill in terms of quality and is now more like Wal-Mart. JCPenney has “old lady” clothing at much higher prices. For the 25-45 set, Kohl’s clothes are good quality at a good price and the styles we like. The customer service is outstanding, as well. Old friends of mine who are now on Facebook will often post, “Going to Kohl’s today! Big sale!” and there will be numerous comments of excitement in response. When I first introduced my husband to Kohl’s, he kind of shook his head and didn’t understand the fascination. The last trip we took to California, an entire afternoon was dedicated to me getting to go clothes shopping so I was stocked up on decent outfits to wear to work. Frugal women wear Ann Taylor Loft to an interview and Kohl’s once they get the job. My husband told me if he’d known women have such dedication to the store, he would have bought stock in them years ago. If only he had! @Sheryl Murphy, you touch on something interesting here re: Target’s clothing. I used to actually buy a lot of stuff at Target–I thought they were one of the best places to buy some cheap shirts and pants to augment the rest of my wardrobe, and many of them blended in style and quality-wise. I haven’t bought any clothing at Target in over two years, however, even though my own budget has hardly gotten more extravagant. When did you notice the dip in quality? Maybe I noticed it too without even realizing. I have a combination of Target and Academy clothing, but I hate shopping for clothes…which is kind of weird because it completely contradicts my love of malls. I noticed the dip in quality around 2005 or so. Right about the time they got big into Mossimo and that stuff. Blech.